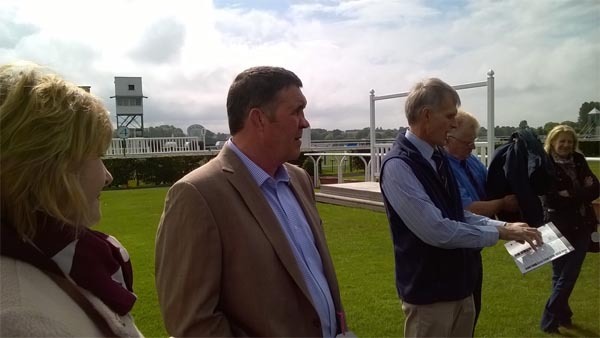 Former Gloucester Captain Keith Richardson showed his fellow former players the way to “back the horses” at Stratford-upon-Avon Racecourse on Monday 14 September 2015. Fourteen players and wives enjoyed the day out at the local racecourse. Despite visits from top jockeys Aiden Colman, Ritchie McLernon, Tom O’Brien and Grand National winner Darryll Jacob, only two winning tips were received. However Richardson backed the last two winners to overtake Ronnie Etheridge who had the lead in the tipsters’ table until the fourth race. Another former Captain, Richard Smith, displayed his knowledge of the Equine world (having visited the Training yards of James Fanshawe at Newmarket the day before). However his tips kept finishing in second place. 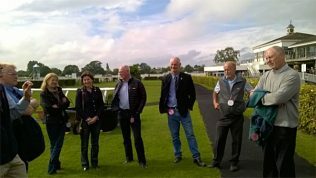 A big thank you to Stratford Racecourse for looking after the Former Players, and it was agreed that a similar visit should be organised for next year. Visit to Leicester Match, 16 Feb 2014. Gloucester Former Players v. Adrian Davies Lodge of Rugby Cricket Match, Sun 2 Jun 2013.